Everywhere I turn these days, my boyfriend Christopher Kimball is out and about promoting The Cook’s Illustrated Cookbook: 2000 Recipes from 20 Years of America’s Most Trusted Cooking Magazine. Within one week, I heard him on NPR’s Fresh Air and another show I can’t recall (The Splendid Table, maybe?) and both times he was singing the praises of Poule au Pot, otherwise known as “chicken in a pot” to us commoners. Roasted chicken is a hands-down favorite around here. For all the fancy stuff I try to shove on my family, simple chicken and gravy is always a winner. Poule au Pot is cooked at 250 degrees, low and slow and covered tightly. Needless to say, this is not roasted and you will be sacrificing brown and crispy skin. The tradeoff, however, is soooooo worth it. This chicken is incredibly juicy and intensely flavored, and yet it is a magically, deceptively simple recipe which uses very few ingredients. Our friends at Cook’s Illustrated have figured out that too many vegetables creates too much humidity inside the pot and diminishes the flavor of the chicken. By using just a small amount of aromatics which were browned first, they achieved the flavor infusion without washing out the chicken with too much humidity. Do not go overboard with the veggies. Shown below is a small bowl of everything aside from salt and pepper which I used, and you can see it’s not much. But when you put it all together and follow the directions? Magic. The cooking times in the recipe are for a 4 1/2 to 5 pound bird. A 3 1/2 to 4 1/2 pound bird will take about an hour, an a 5 to 6 pound bird will take close to two hours. We developed this recipe to work with a 5 to 8 quart pot with a tight-fitting lid. If using a 5-quart pot, do not cook a chicken larger than 5 pounds. 1. Adjust oven rack to lowest position and heat oven to 250 degrees. Pat chicken dry with paper towel and season with salt and pepper. Heat oil in large Dutch oven over medium heat until just smoking. 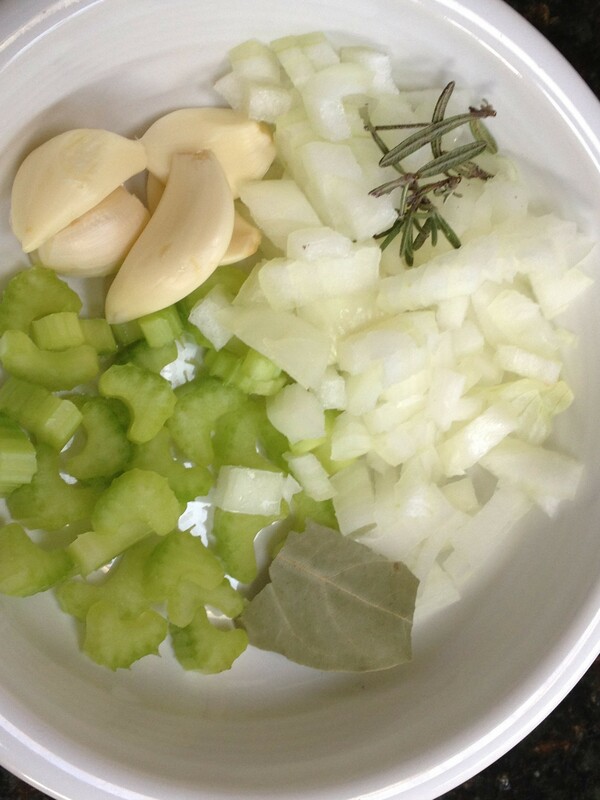 Add chicken breast-side down; scatter onion, celery, garlic, bay leaf and rosemary around chicken. Cook until breast is lightly browned, about 5 minutes. Using a wooden spoon inserted into cavity of bird, flip chicken breast side up and cook until chicken and vegetables are well browned, 6 to 8 minutes. Remove Dutch oven from heat; place large sheet of foil over pot and cover tightly with lid. Transfer pot to oven and cook until an instant read thermometer registers 160 degrees when inserted in the thickest part of the breast and 175 degrees in the thickest part of the thigh, 80 to 110 minutes. 2. Transfer chicken to carving board, tent with foil and rest 20 minutes. Meanwhile, strain chicken juices from pot through a fine-mesh strainer into fat separator, pressing on solids to extract liquid; discard solids (you should have about 3/4 cup juices). Allow liquid to settle 5 minutes, then pour into saucepan and set over low heat. Carve chicken, adding any accumulated juices to saucepan. Stir lemon juice into jus to taste. Service chicken, passing jus at table. This entry was posted in Chicken, Main Dish and tagged Cook's Illustrated, French chicken in a pot, poule au pot by Mom Mom's Apron. Bookmark the permalink.